Magick, Music, Books, Toys, Comix, Art & Stuff. 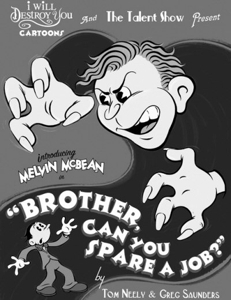 Tom Neely and Greg Saunders originally put together a shorter version of "Brother Can You Spare A Job?" for the MoveOn competition. This is a seven minute version that is truly impressive. An overview of some of my painting, graphics and crafts . About, and where to find machines. I'm colorist for Took Gallagher's animal series.